If I had a dollar for every time my son asked me for a new pet…we’d have a dog, it’d have its own house, and a full-time caretaker for it (that isn’t me). My family already has one little fish who has been swimming lopsided for about six months. 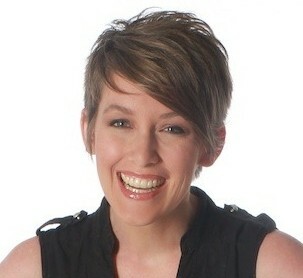 However, if my son Kai had his way, we’d have two dogs, three cats, and seven more fish (and probably a turtle). Pet care inevitably falls on me, so our beloved fish will have to deal with being our sole pet for now. Forewarning: You may have to pop into a pet store to pick up some supplies for this project. Whenever I have to go into a pet store with Kai, I explain beforehand we aren’t getting any new pets, but Kai does spend at least thirty minutes or more looking (scratch that, daydreaming) at all of the animals. So if you’re going to the store with your kids, allocate enough time for window shopping. Anyway, back to the project. 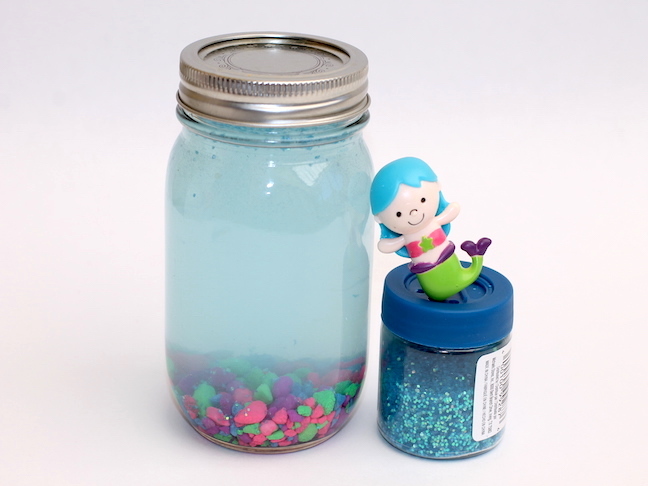 This adorable little mason jar aquarium is a perfect addition to your kid’s bookshelf; it’s so simple to make and no maintenance is required (yay!). I stocked mine with little mermaids, but you can leave the faux animal choices up to your kids. 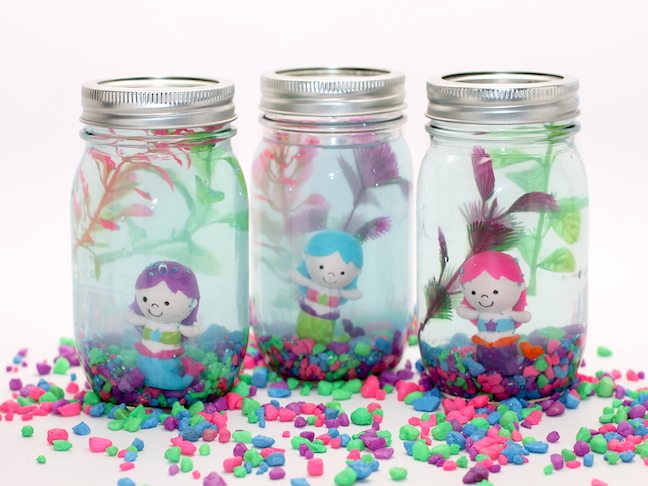 Whether they want to stock them with fake goldfish, shark, or tigers (hey, it’s a stretch, but there’s really no limit), this mason jar aquarium takes only about five minutes to make, so you can quickly build up a menagerie of faux pets, if you and your kids are up to it. 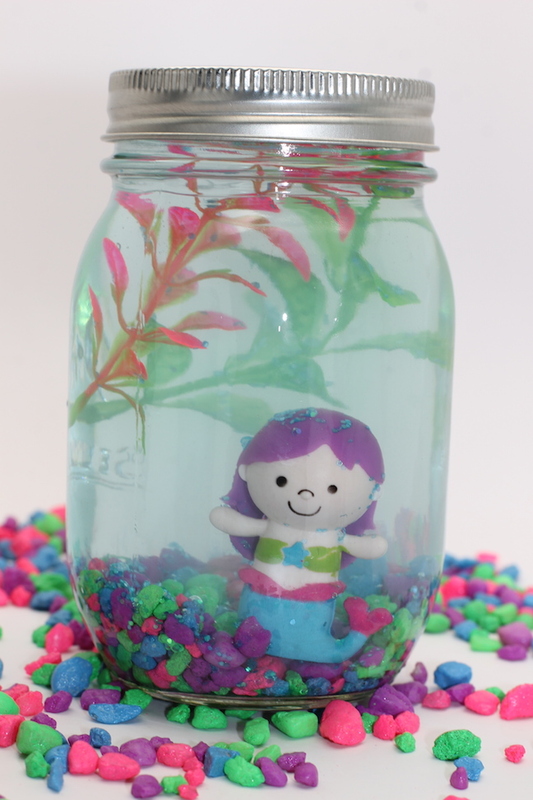 It goes without saying, but this mason jar aquarium is not suitable for live fish or animals. It’s for pretend play only. 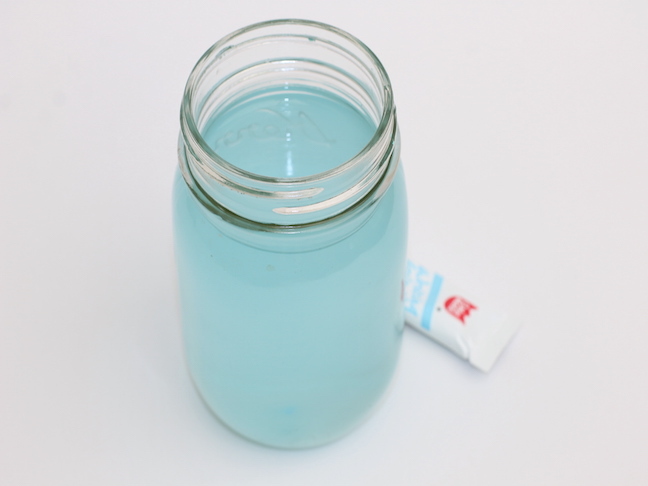 Step 1: Fill your mason jar with water. Then add a few drops of food coloring. Put the lid on the jar and shake it up. 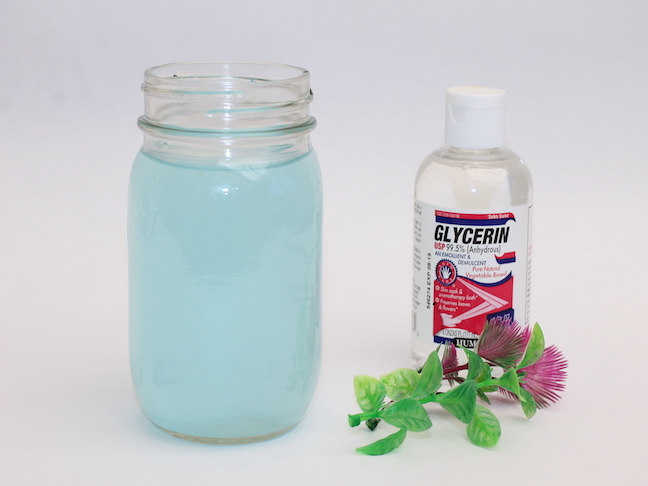 Step 2: Add about two tablespoons of glycerin (you could also use school glue or corn syrup). Note: The more glycerin or glue you add, the slower the glitter falls. 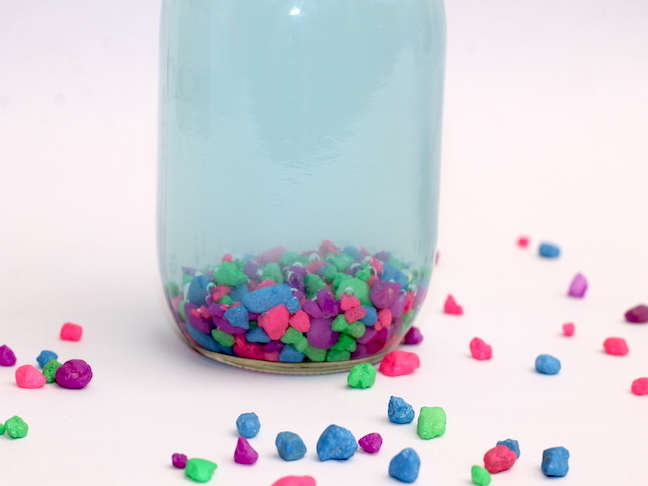 Step 3: Add two small handfuls of aquarium gravel to the mason jar. Step 4: Sprinkle glitter into your water. Put the lid on and shake it up. 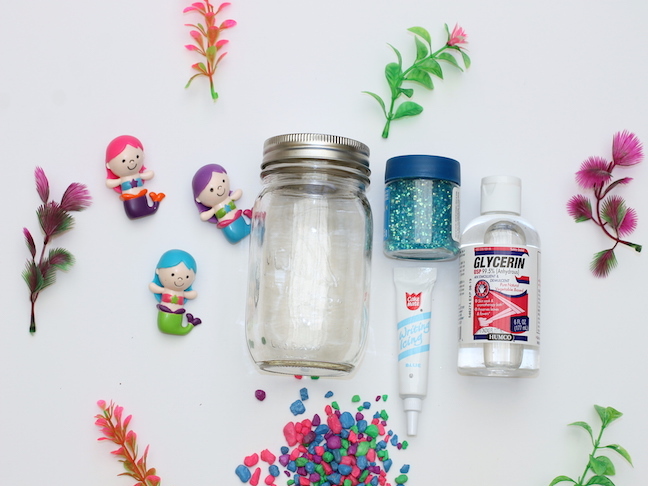 Remove any clumpy glitter with a spoon. Step 5: Add your mermaid figurine and plastic aquarium plants. You only need two pieces of a plant per mason jar. Step 6: Close the lid and enjoy!